Whenever your website becomes inaccessible or returns incorrect data ServiceUptime alerts you within seconds of the event via email or SMS. Get Notified When Your Website Goes Down! ServiceUptime is remote website uptime monitoring designed to help you detect website downtime which can mean lost revenue and profits. The worst thing is users may never return to your website again if they experience difficulties opening your webiste. Register for free website monitoring account and take control over downtime today! Let ServiceUptime monitor your website 24/7/365 and alert you immediately upon your website accessibility, availability or performance problems. 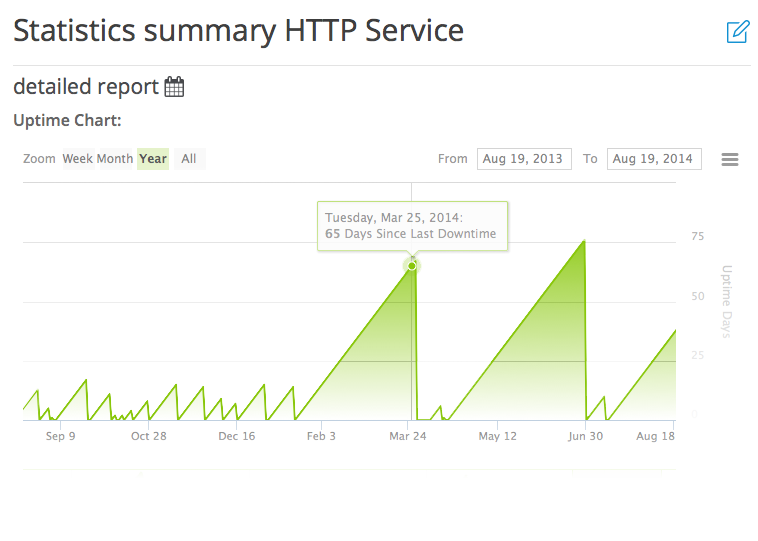 The monitoring frequency is how often your website is checked. You have the ability to monitor any service every 1, 2, 3, 5, 10, 15, 30 and 60 minutes. You choose the frequency of checks at your users control panel while setting up monitoring service. Upon service outage you can be notified by email and sms. Email notification is an alert with details of the service being down and the error it returns. SMS alert is a short notification sent to your cell phone with the status of monitoring service. What is the advantage of ServiceUptime monitoring? The service that we used from ServiceUptime is outstanding! We have been very pleased with the service. Keep up the excellent work! Every monitoring service comes with lifetime monitoring statistics where you can see your site uptime by week, month, year or overall statistics. You can also see your daily statistics. 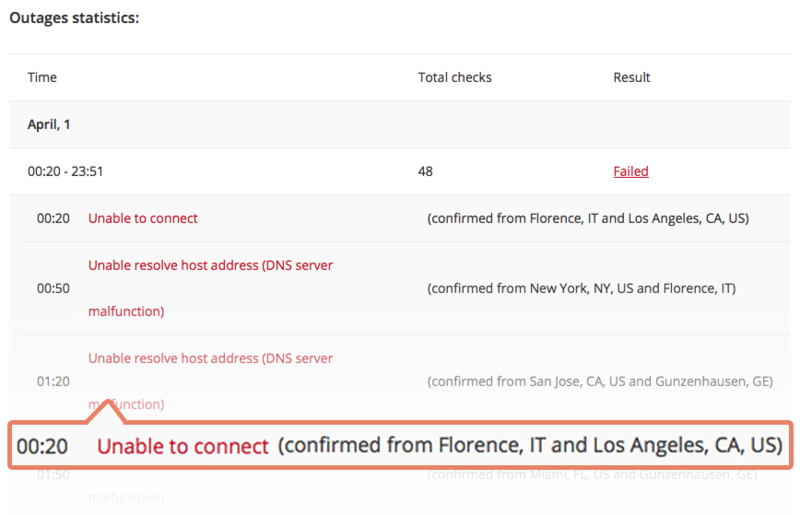 Detailed information on every downtime with the number of failed checks and time your website was inaccessible and the type of error is available at Outage Report for every monitoring service. 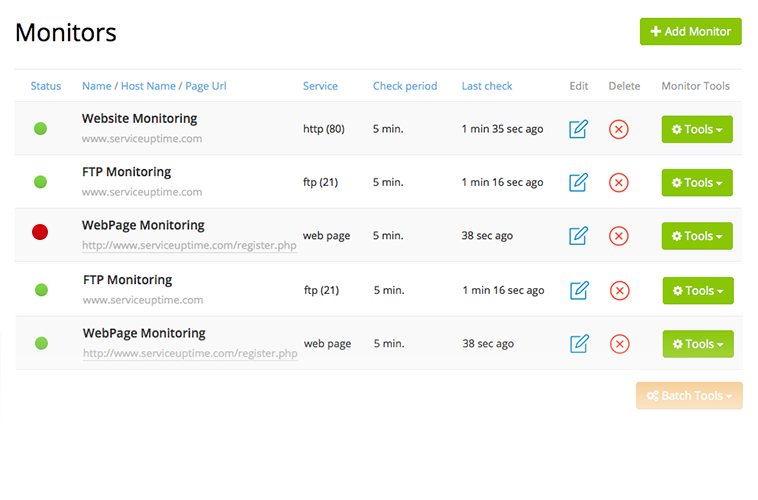 Your Monitors Report will show current status of all monitoring service and the time it was last checked on one page.